On February 24, 2008, Cuba’s National Assembly of People’s Power (ANPP) elected Raúl Castro as the nation’s President. The younger Castro (76 years old at the time) had served as interim President since early August 2006, when older brother Fidel (nearly 80 years old at the time) vacated the post because of illness. This transfer of power at the highest level—the first in Cuba in close to five decades—raised expectations in the island and abroad about policy changes, particularly in the economic arena, as Raúl had a reputation of pragmatism and openness to economic reform, in contrast to his more ideological and conservative brother. This paper selects elements of Raúl Castro’s views on key challenges facing the Cuban economy and evaluates efforts to address them roughly four years into his government. It concludes that despite high expectations of change, Raúl’s management of the economy has been orthodox and has failed to deliver on key structural reforms that are sorely needed in the island. Unlike his loquacious older brother, it is not Raúl’s style to give many or very long speeches and interviews. Thus, a review of his public interventions for the purpose of culling economic priorities is not nearly as difficult an undertaking as it would have been with Fidel. The emphasis here is on views publicly expressed since mid-2006 when Raúl’s interim Presidency commenced. Perhaps the most significant articulation of Raúl Castro’s economic priorities and views was embodied in his July 26, 2007 address to the nation. As mentioned above, in that address, Raúl spoke about deep rooted problems afflicting the country’s economy that could not be solved overnight and hinted about openness to new ideas. To be sure, an important element—and indeed a common theme in his speeches—is the need for tighter discipline and harder work, but these exhortations are old news and readily discounted by the population. The July 26, 2007 address may have been the high water mark with respect to openness to economic policy experimentation, however, as relatively little new ground has been broken since then. A stagnant agricultural sector, which produces ever declining shares of food requirements and results in rising food imports, despite an abundance of idle cultivable land. A cumbersome and inefficient distribution system for agricultural and non-agricultural products that fails to meet the needs of consumers and wastes energy in unnecessary transportation, coupled with excessive restrictions on Cuban consumers, who are not permitted to purchase a wide range of products or services which are accessible to foreigners. A labor compensation system that fails to reward workers properly for their work, produces wages that are not sufficient to meet the needs of workers, and results in low productivity. A dearth of domestic investment resources and a need to stimulate foreign direct investment that can also provide technology and access to foreign markets for Cuban products. Policy development and implementation around the four topics mentioned above have been uneven and generally speaking quite weak. With respect to one of the four, a stagnant agricultural sector, discrete but tangible steps have been taken. More modest steps have been taken with respect to two others, a cumbersome and inefficient distribution system and the need to rationalize wages. Finally, with regard to stimulation of foreign investment, no tangible progress can be detected to date. The secular decline of Cuba’s agricultural sector, and particularly the steep contraction in the last two decades, has been well documented by Cuban economist Nova González.6 He has pointed out that as recently as 1991, the agricultural sector (including sugar production) was responsible for 83% of the value of the island’s total goods exports; 7 the comparable figure for 2009–2010 was 15–17%. Similarly, while in 1990 agriculture’s contribution to GDP was 8.6%,8 in 2009 it was 3.7%.9 At present, domestic food production provides 40% of calories and 37% of proteins consumed daily by the Cuban population. 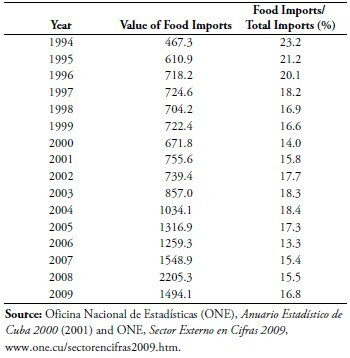 10 The gap in food supplies is met by imports, which have been rising rapidly, as shown in Table 1; in 2009, food imports amounted to nearly 1.5 billion pesos and represented about 17% of the value of imports. In one of his first interventions after becoming interim President, Raúl Castro spoke in strong terms at a December 2006 meeting of the ANPP about “bureaucratic red tape” that resulted in government not making payments to individual farmers and cooperatives responsible for producing 65% of the island’s vegetables.11 Accumulated arrears for agricultural products acquired under the acopio system, were a heavy economic burden on private farmers and cooperatives. In early 2007, the Cuban government began to settle the arrears, raised acopio prices for some products (milk and meats), and took steps to make it easier for farmers to buy agricultural inputs (machetes, work gloves, fertilizers) at government stores. Perhaps the most significant structural economic initiative in a decade was launched in mid-2008 with the passage of Decree-Law No. 259, on transfers of idle land.12 According to official figures cited by Castro, land under cultivation had declined by 33% between 1998 and 2007.13 Pursuant to Decree-Law No. 259: (1) landless individuals could obtain up to 13.42 hectares and existing landholders could bring up their total holding to 40.26 hectares for their use for 10 years, renewable for an additional 10 years; and (2) existing state farms, cooperatives, and other legal entities could apply for the usufruct of unlimited amounts of idle lands for 25 years, renewable for another 25. While the distribution of idle land to private farmers, the increase in acopio prices, and the enhanced availability of inputs to farmers are all positive steps, the success of the measures in delivering more food production to consumers will depend on many other factors, among them reforming the bureaucratic and inefficient acopio system and improving the transportation system. Bottlenecks and failures of these two systems result in the waste or spoilage of a high share of perishable food products. To be sure, changes to the intricate distribution system of the kind mentioned by Raúl are positive, but why not get rid of acopio and of the rationing system altogether, ridding the nation of two inefficient and distortive systems that have been in place for nearly 50 years! A potentially significant step introducing some flexibility into the labor market was the issuance by the Ministry of Labor and Social Security (MTSS) in June 2008 of Resolution No. 9, which required enterprises to put in place multiple pay systems tied to performance.25 Prior to the issuance of Resolution No. 9, the practice was for the pay of all workers in an enterprise—from line operators to top managers—to be tied to one global indicator of enterprise performance, such as an overall physical production target, or a sales or profit target. Needless to say, such system did not reward individual workers for their performance. The new resolution recognized the need for there being, within an enterprise, multiple pay systems each related to the nature of the activity carried out by a worker or a group of workers and connected to the quantity and/or quality of goods and services they produced. Enterprises were to come into compliance with the new pay system by August 2008. One of the statistics that Cuba cites as evidence of the success of its economic model, but defies economic logic, is the unemployment rate. In the context of discussing the very challenging external economic environment faced during 2009, and while reporting a growth rate for the year of 1.4% (compared to a projected growth rate of 6.0%), Minister of Economics and Planning Marino Murillo informed that employment had grown by 2.5% compared to 2008 and the unemployment rate was 1.7%,29 probably one of the lowest, if not the lowest, in the world. The oddness of Cuba’s exceedingly low unemployment rate is evident from the statistics in Table 2, culled by CEPAL for Latin American and Caribbean countries. CEPAL estimates the average unemployment rate for the region in 2009 at 8.3%, 4.9 times the reported unemployment rate for Cuba. For the large, diversified economies in the region, the unemployment rates were 8.8% for Argentina, 8.1% for Brazil, 9.8% for Chile, 13.0% for Colombia, and 8.3% for Peru. Even Venezuela, Cuba’s closest ally and economic patron, reported an unemployment rate of 8.0% in 2009. This is not surprising, as Cuban gross capital formation was around 10% in 2007,43 clearly insufficient to support growth in the ensuing years. FDI could boost investment and also bring new technology and access to markets for Cuban exports. Whether or not consultations have occurred, to date there is little in the form of actions that would differentiate Raúl’s management of the Cuban economy from his brother’s. 2. On GAESA’s structure and reach see Sergio Díaz-Briquets and Jorge Pérez-López, Corruption in Cuba: Castro and Beyond (Austin: University of Texas Press, 2006), 157–60. 3. Speech is at http://www.granma.cubaweb.cu/2007/07/27/nacional/artic01.html. 5. Armando Nova González, “Importancia económica del sector agropecuario en Cuba,” Cuba Siglo XXI, no. 91 (November 2008). 6. See, e.g., Armando Nova González, La agricultura en Cuba: Evolución y trayectoria (La Habana: Editorial de Ciencias Sociales, 2006). 7. Armando Nova González, “El papel estratégico de la agricultura: problemas y medidas,” Temas (April 9, 2010). 8. 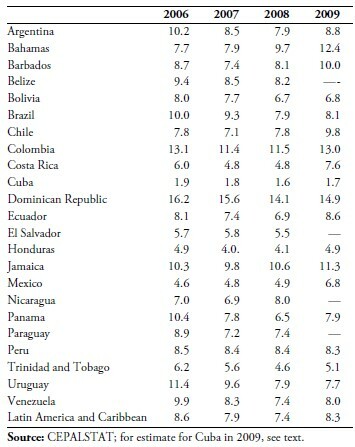 Estimated by Comisión Económica para América Latina y el Caribe (CEPAL), Cuba: Evolución Económica durante 1998, LC/MEX/ L.392 (August 1999), p. 21. 9. Based on Anuario Estadístico de Cuba 2009 (2010), www.one.cu/aec2009/20080618index.htm. The very low contribution of agriculture to GDP in 2009 needs to be interpreted with care, as it reflects a revaluation of the output of services sectors that occurred in 2004–2006. The cited figure of agriculture’s share of GDP in 2009 is not comparable to the figure for 1990. 10. Armando Nova González, “El papel estratégico de la agricultura: problemas y medidas,” Temas (April 9, 2010). 11. Anita Snow, “Raúl Castro speaks about Cuba food woes,” Associated Press (December 23, 2006). 12. Decreto-Ley No. 259 sobre la entrega de tierras ociosas en usufructo, in Granma (July 13, 2008), http://www.granma.cubaweb.cu/ 2008/07/18/nacional/artic05.html. 14. Ana Margarita González, “Entrega de tierras (I): Realidades y manipulaciones,” Juventud Rebelde (July 6, 2009) and “Entrega de tierras (II): Con premura, pero sin chapucerías,” Juventud Rebelde (July 13, 2009). 16. G.B. Hagelberg and José Alvarez, “Cuban Agriculture: The Return of the Campesinado,” Cuba in Transition—Volume 19 (Washington: Association for the Study of the Cuban Economy, 2009), pp. 238–239. 17. “Hungry for change: The timidity of agricultural reform,” The Economist (March 25, 2010). 18. Juan O. Tamayo, “Cuban farmers seek fewer government regulations,” Miami Herald (May 18, 2010). 19. Tamayo, “Cuban farmers seek fewer government regulations”; Patricia Grogg, “Nueva estrategia agrícola sin reformas profundas,” IPS (May 18, 2010). 21. Marc Frank, “Cuba’s aging leaders move to shore up revolution,” Reuters (March 26, 2008); Carmelo Mesa-Lago, La economía cubana en la encrucijada: el legado de Fidel, el debate sobre el cambio y las opciones de Raúl, Documento de Trabajo No. 19/2007, Real Instituto Elcano, Abril 23, 2008, p. 31. 22. “Castro employing a bit of capitalism to freshen up Cuba,” The New York Times (April 3, 2008). 24. Lázaro González Rodríguez, “La Revolución exige cambios en la política laboral: Actualidad de la política laboral en Cuba,” Cuba Siglo XXI, no. 92 (December 2008). 25. Lourdes Pérez Navarro, “Nuevo sistema de pago por resultados,” Granma (June 11, 2008); “Cuba: Raúl Castro terminará con el igualitarianismo salarial,” Infolatam (June 12, 2008). 26. Lourdes Pérez Navarro, “Implementar el sistema de pago por resultados,” Granma (October 28, 2008); “El sistema de ‘pago por resultados’ deberá esperar hasta enero,” Cubaencuentro (October 28, 2008). 27. An article by a Cuban journalist who writes for Juventud Rebelde complaining about pressure from government officials to publicize the pay for performance system contrasted with the absolute silence on its implementation and the refusal of officials to answer journalists’ questions about it, was posted in the electronic version of Juventud Rebelde on October 16, 2009 and was quickly taken down, although it was captured by a blogger in Europe. The article, by José Alejandro Rodríguez, is titled “Contra los demonios de la información secuestrada.” It was posted by blogger Jorge Ferrer in his blog “El tono de la voz,” on October 17, 2009. See http:// www.cubaencuentro.com/jorge-ferrer/blogs/el-tono-de-la-voz/juventud-rebelde-y-la-informacion-secuestrada. 29. “En el año 2010 debemos trabajar con intensidad y disciplina para lograr el máximo de eficiencia,” Granma (Diciembre 21, 2009), http://www.granma.cubaweb.cu/2009/12/21/nacional/artic03.html. Table 2. Average Annual Unemployment Rates (%) 2006 2007 2008 2009 Argentina 10.2 8.5 7.9 8.8 Bahamas 7.7 7.9 9.7 12.4 Barbados 8.7 7.4 8.1 10.0 Belize 9.4 8.5 8.2 —- Bolivia 8.0 7.7 6.7 6.8 Brazil 10.0 9.3 7.9 8.1 Chile 7.8 7.1 7.8 9.8 Colombia 13.1 11.4 11.5 13.0 Costa Rica 6.0 4.8 4.8 7.6 Cuba 1.9 1.8 1.6 1.7 Dominican Republic 16.2 15.6 14.1 14.9 Ecuador 8.1 7.4 6.9 8.6 El Salvador 5.7 5.8 5.5 — Honduras 4.9 4.0. 4.1 4.9 Jamaica 10.3 9.8 10.6 11.3 Mexico 4.6 4.8 4.9 6.8 Nicaragua 7.0 6.9 8.0 — Panama 10.4 7.8 6.5 7.9 Paraguay 8.9 7.2 7.4 — Peru 8.5 8.4 8.4 8.3 Trinidad and Tobago 6.2 5.6 4.6 5.1 Uruguay 11.4 9.6 7.9 7.7 Venezuela 9.9 8.3 7.4 8.0 Latin America and Caribbean 8.6 7.9 7.4 8.3 Source: CEPALSTAT; for estimate for Cuba in 2009, see text. 31. Oficina Nacional de Estadísticas, Anuario estadístico de Cuba 2009, Table 7.2, www.one.cu. 32. Maurcio Vicent, “Cuba debe despedir a un millón de empleados estatales,” El País (May 2, 2010). 33. Salvador Mesa, “La batalla económica, lo sabemos los trabajadores, es como nunca antes tarea vital,” Granma (May 2, 2010). 34. “Cuba entrega la gestión de barberías y peluquerías a sus empleados,” El Mundo.es (April 12, 2010), http://www.elmundo.es/ america/2010/04/12/cuba/1271099479.html. 35. Rosa Tania Valdes, “Cuba letting drivers rent buses, make money,” Reuters (May 17, 2010). 36. CEPAL, Cuba: Evolución Económica durante 1998, p 18. 37. CEPAL, Cuba: Evolución Económica durante 1998, p 18. 38. Although Cuba had passed legislation in 1982 that allowed foreign investment in the form of joint ventures, it was not until the early 1990s that the government began aggressively to seek foreign investment, principally in the tourism industry. The opening to FDI was cemented in 1995 with the passage of a comprehensive foreign investment law. See “Ley No. 77—Ley de las inversiones extranjeras,” Gaceta Oficial (September 6, 1995). 39. For estimates and their sources see Jorge Pérez-López, “The Rise and Fall of Private Foreign Investment in Cuba,” Cuban Affairs, 3:1 (2008). 40. Marc Frank, “Western businessmen bitter as Cuba closes doors,” Reuters (May 31, 2005). 41. Pérez-López, “The Rise and Fall of Private Foreign Investment in Cuba,” lists publicly announced investments from Venezuela and China from 2004 to 2007; investments from foreign private sources include a cement factory with Spanish capital, the expansion of a nickel production plant with Canadian capital, and modernization of a container port facility with Dubai capital. 43. ONE, Anuario Estadístico de Cuba 2009 (2010), at www.one.cu/aec2009/20080618index.htm. 44. The executive, Roberto Baudrand, was found dead in his apartment in Havana. Baudrand managed the enterprise Alimentos Rio Zaza, a 50–50 joint venture between the Cuban government and Ingelco, a Chilean firm owned by Max Marambio, once upon a time a close friend and protégé of top Cuban authorities. Marambio also had another joint venture with the Cuban government, Sol y Son, active in the tourism sector. The deposed head of the Institute of Civil Aeronautics (which controls the airline Cubana de Aviación), General Rogelio Acevedo, allegedly also had connections with Sol y Son. See José de Córdoba, “Chile Presses Cuba Over Death of an Executive,” Wall Street Journal (April 15, 2010); Juan Tamayo, “Muerte de empresario chileno aviva el escándalo de corrupción en Cuba,” El Nuevo Herald (April 15, 2010). 45. Oscar Espinosa Chepe, “Raúl Castro, dos años después,” El Nuevo Herald (24 de febrero de 2010). For an assessment of Raúl’s first year in power, which concluded that other than with respect to agriculture, the rest of economic changes were superficial, see “Raúl A Year Later,” The Latell Report (February 2009). 46. Philip Peters, Raulonomics: Tough Diagnosis and Partial Prescriptions in Raúl Castro’s Economic Policies (Arlington, Virginia: Lexington Institute, July 2009). 47. For speculation on policy reforms see, e.g., David Adams, “Cuba flirts with economic reforms,” St. Petersburg Times (March 8, 2008); “Raúl Castro employing a bit of capitalism to freshen up Cuban Communism,” The New York Times (April 3, 2008).